"There's only one way I'd deal with that..."
The incredible ease with which a woman in Australia wrangled a snake out of her office is impressing many on the Internet. 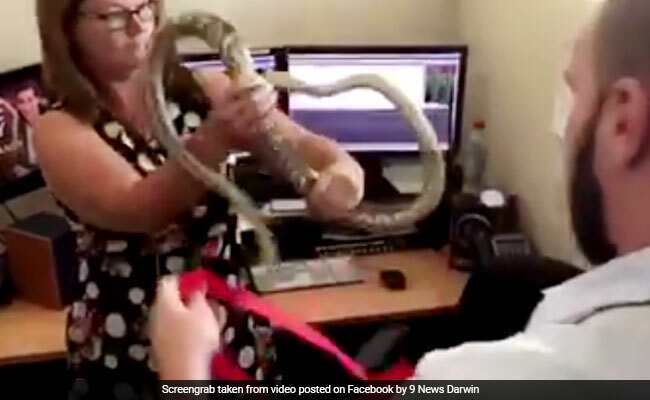 A short video uploaded on Facebook by 9 News Darwin shows the snake coiled up next to a computer in the news channel's office. Writing on Facebook, the channel explains that on Monday, a cameraperson first spotted the snake curled up next to a computer in the editing suite. Luckily, an employee who had experience handling reptiles safely removed the nearly two-metre snake from the office. In the video, the employee can be seen using a wire hanger to gently pry the snake away from the computer. She then fearlessly grabs it and tries to put it in a bag. Kate Limon, a news director with the Australian broadcaster, also tweeted the video, provoking a flurry of reactions on social media. : Do you have any experience in video production or handling and removing live snakes, both your hired. According to Ms Limon, the snake was released into the wild.